Newport Coast, Calif. (Oct. 5, 2011) — There’s not much that two-time Formula DRIFT (FD) champion Samuel Hübinette hasn’t accomplished in his career. The man known as the “Crazy Swede” has the most career wins of any FD driver, but victory has eluded him at the most prestigious venue on the FD circuit — legendary Irwindale (Calif.) Speedway, also known as the “House of Drift.” Hübinette will look to end that drought at Irwindale with a victory in the 2011 FD season finale, scheduled for Oct. 7–8. Hübinette has earned a number of podium finishes at Irwindale, including one to clinch the 2006 FD championship. 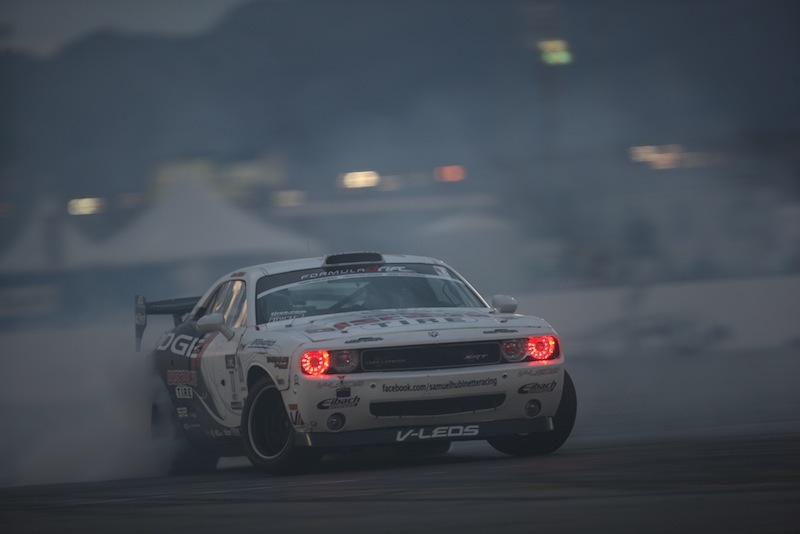 The Dodge Motorsports BFGoodrich Dodge Challenger pilot and his Samuel Hübinette Racing (SHR) driver and teammate, Dean Kearney, who will once again take the wheel of the V-LEDS Dodge Viper SRT10, are poised for strong runs in the Irwindale field. Xtreme Drift Circuit Round 1 has just passed us by and congratulations again to Chelsea DeNofa. Pictured above on a run through the inside apex is Chelsa doing his thing. Check out the full gallery located here.